Composed by Roger Boutry. Leduc. Post-1900. Softcover. 16 pages. Alphonse Leduc #AL23463. Published by Alphonse Leduc (HL.48182323). “As a musical genre of the 18th century, it is unusual that a divertimento is composed for the Alto Saxophone, an instrument which was not developed until the mid-19th Century. Yet Roger Boutry (b. 1932) proves with his Divertimento for Alto Saxophone that the combination of style and instrument make for a thrilling performance. French composer Boutry won many prizes during his time at the Paris Conservatoire, as well as for his professional work. He has over 100 published works in which he successfully unites diverse modern and traditional trends. He was named Personality of the Year in 1989 for all of his artistic activities. 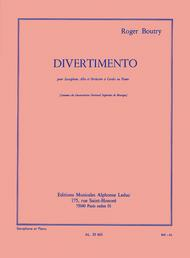 Divertimento is cast in three movements, beginning in a highly rhythmic and syncopated way before moving on to a moody and balladlike second movement that ends with a cadenza. This leads into the third movement, a light, presto finale. 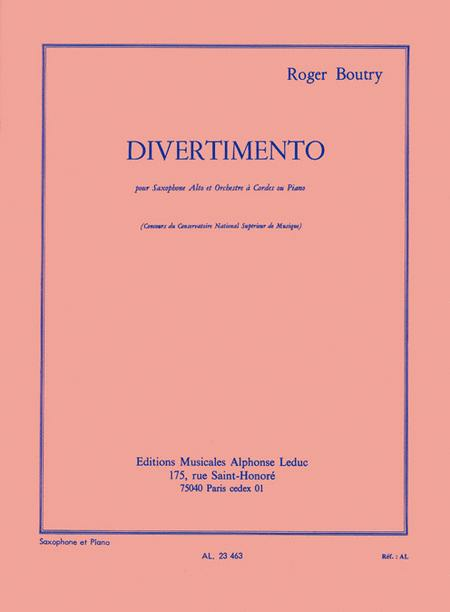 Boutry's Divertimento for Alto Saxophone and Piano accompaniment is an essential and varied addition to the advanced saxophonist's repertoire.”.